The stolen data that are at least 500 million pages of government records includes top-secret information about "national defense." 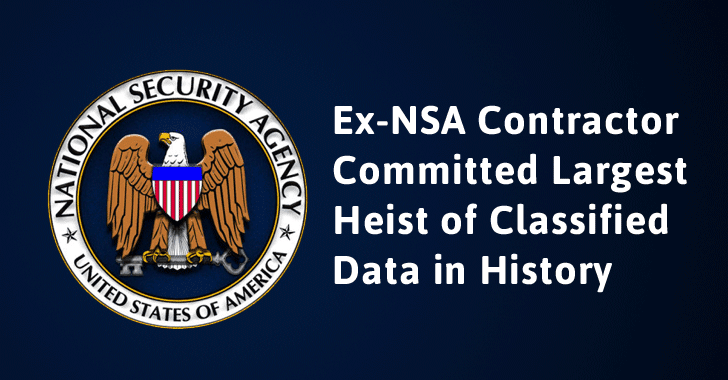 If all data stolen by Martin found indeed classified, it would be the largest NSA heist, far bigger than Edward Snowden leaks. According to the new filing, Martin also took "six full bankers’ boxes" worth of documents, many of which were marked "Secret" and "Top Secret." The stolen data also include the personal information of government employees. The stolen documents date from between 1996 through 2016. "The document appears to have been printed by the Defendant from an official government account," the court documents read. "On the back of the document are handwritten notes describing the NSA's classified computer infrastructure and detailed descriptions of classified technical operations." It's not clear exactly what Martin allegedly stole, but The New York Times reported Wednesday that the stolen documents also included the NSA's top secret hacking tools posted online by a supposed hacking group, calling itself Shadow Brokers, earlier this year. The NY Times report suggests that the FBI has found forensic evidence that the hacking tools and cyber-weapons posted online by the alleged hacking group had actually been on a contractor's machine. Martin has "obtained advanced educational degrees" and has also "taken extensive government training courses on computer security," including in the areas of encryption as well as secure communications. A former US Navy veteran, Martin allegedly used a sophisticated software that "runs without being installed on a computer system and provides anonymous Internet access, leaving no digital footprint on the Machine." It's believed that Martin was using TAILS operating system or another USB-bootable operating system in conjunction with Tor or a VPN that would not leave any forensic evidence of his computer activities. Martin's motives are still unclear, but among the seized documents, investigators uncovered a letter sent to Martin's colleagues in 2007, in which he criticized the information security practices of government and refers to those same co-workers as "clowns." The letter reads: "I will leave you with this: if you do not get obnoxious, obvious, and detrimental to my future, then I will not bring you; into the light, as it were. If you do, well, remember that you did it to yourselves."